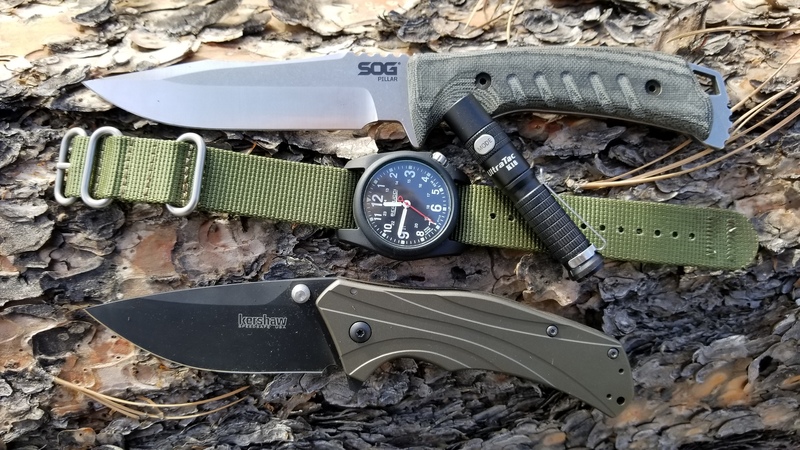 What are you looking for in an outdoor folding knife? Traits such as strength, lightness, dependability, and versatility generally come to mind. 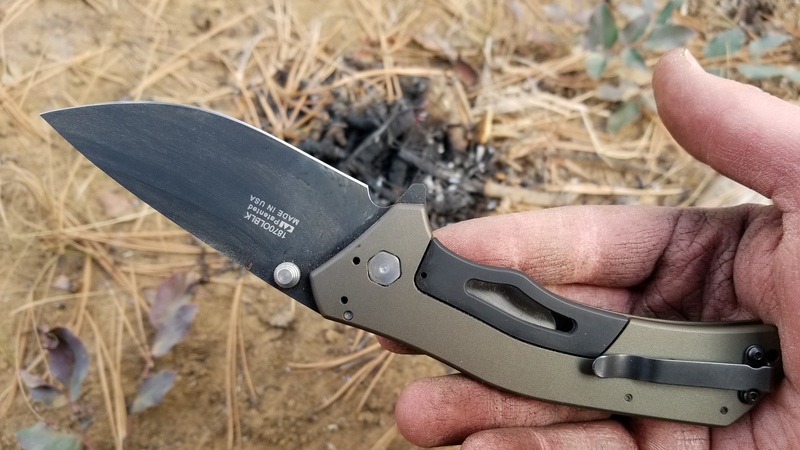 The Kershaw Knockout hits several of these marks, making it one of the more interesting folders I’ve carried into the wilderness. 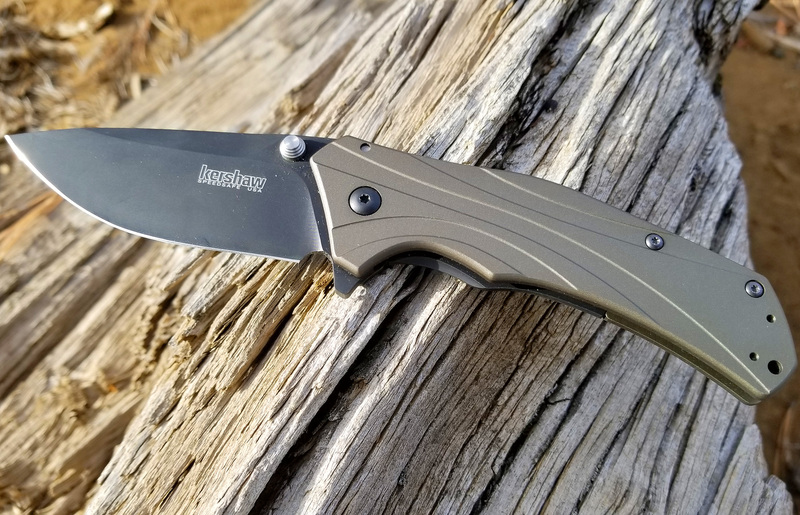 Retailing for $120 on Kershaw’s website (or $75 at BladeHQ), this OD Green model is a slight step up from the standard black-handled version. 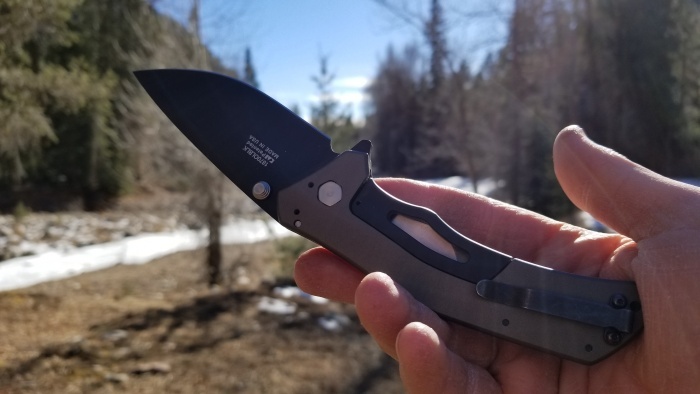 This particular example was loaned to me by YouTube knife guru Nick Shabazz, who generously allowed me to take it into the wild. Sorry about the scratches, Nick. But enough apologies – I’ve got pugilism puns to make. 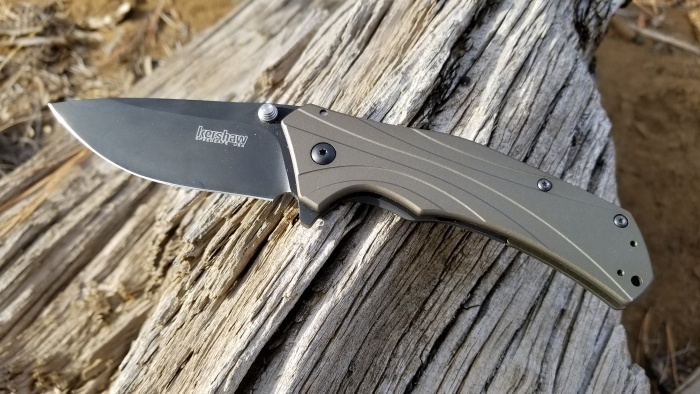 On to the review of the Kershaw Knockout! The centerpiece of the Knockout’s offense is a 3.25-inch blade forged from Sandvik 14C28N steel. It wears a stonewash finish across its 0.12-inch shoulders, with an aluminum handle adding another 4.6 inches to the package. 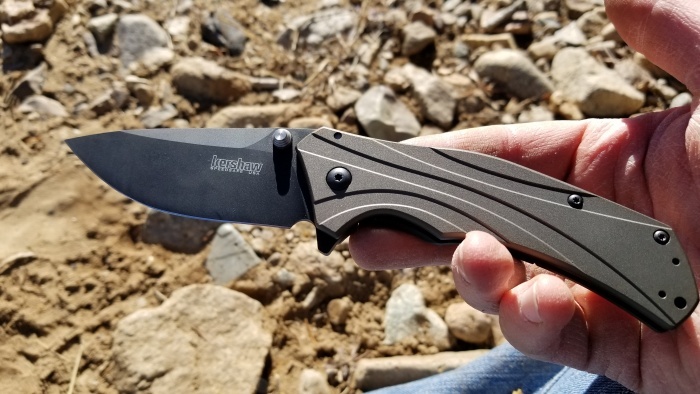 Overall, you’re looking at a middle-weight contender measuring 7.9 inches from the tip of its drop point to the top of its deep-carry pocket clip. There’s an interesting bit of innovation behind the knife’s moniker too. 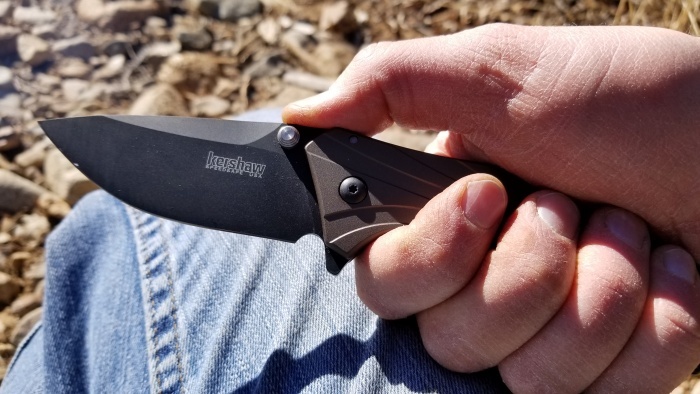 As Kershaw puts it, the idea came from its patented Sub-Frame Lock. That weight, to be specific, is 3.4 ounces – not a lot of mass, considering the knife’s overall dimensions. Another, less tangible feature is its American pedigree. The Knockout represents one of Kershaw’s new USA-made line, adding some extra panache to its record. This is especially true given its $68 starting price, showing that domestic manufacturers can keep pace with international competition. The Knockout’s hollow grind has both pros and cons. First and foremost, it makes this a competent slicer. Rope, onions, potatoes, cardboard – against any of these it’s a champ. But when it squares off against a piece of wood, well, the Knockout takes it on the chin. 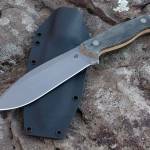 Unlike Scandi grinds (such as those found on Moras), this particular configuration features a very abrupt edge bevel. This makes it difficult for the blade to bite into the wood. You can carve, yes, but it’s not a pleasant experience. Given the tallness of its blade, I’m surprised that Kershaw sends them out with such a sudden edge. Still, the Knockout functions well overall. It’s lightweight, easy-riding, and generally good in the hand. The lockbar causes a bit of hot-spotting with my index finger, but a slight change in grip usually clears this up. I find the Kershaw Knockout to be a perfectly serviceable tool, especially as a backup to an outdoor fixed blade. 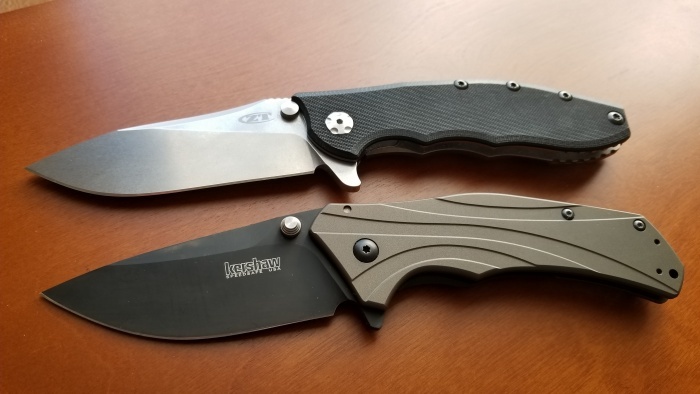 Let’s talk about the spring-assisted elephant in the room: Kershaw’s notorious SpeedSafe system. For those unfamiliar with the term, take a look at the disassembly photo below. See that steel rod in the middle, covered in grease? It’s a torsion bar set inside the handle scale. Its tip fits into a hole at the base of the blade, providing a bit of extra oomph to help the knife fly open. On the plus side, this makes for fast, reliable deployment under a variety of circumstances. The Knockout’s blade can be activated with either the thumb studs or flipper tab, which are nice options to have. But, there are a few downsides to SpeedSafe. It’s not a subtle system: A loud snap announces the blade’s deployment. Assisted knives can also be harder to close because you’re pushing back against the torsion bar. And there’s the question of legality because many major U.S. cities (e.g., New York, Chicago) frown upon assisted-opening mechanisms. Oh, and the assist makes the tool harder to disassemble, so knife purists generally turn up their noses. So where do I land in this fight? 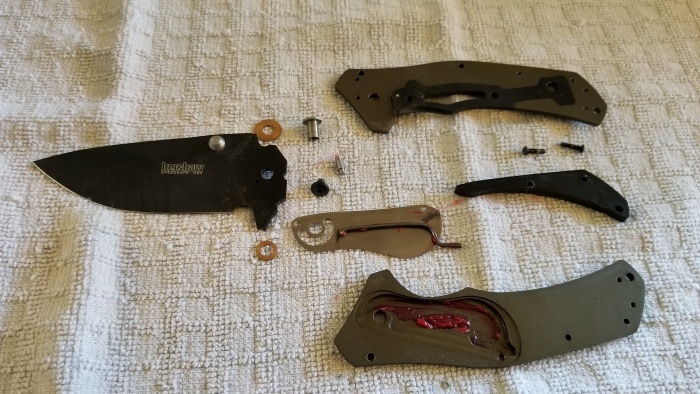 While I agree that assisted-opening knives are tougher to take down, I think they’re actually better suited for hard use than, say, a blade running on bearings. Sure, your $200 Zero Tolerance (pictured below) is going to be smoother, but what generally happens to tools when you’re hiking or camping? They get dirty. And once that dust and grime gets between those bearings, your blade’s going to hiss in protest every time it swings open. The Knockout, for its part, has no such weakness. The only sound you’ll hear from its bronze washers and SpeedSafe technology is the satisfying snap of its sub-frame lockup. While it may not be as elegant as something higher on the production scale, I think it’s perfectly acceptable for knives you actually plan to use. What we have here is a well-priced, solidly constructed SpeedSafe knife with a unique (and somewhat confusing) job profile. It’s light and strong enough for life in the wild, but its edge won’t do you any favors when paired against poplar – or any wood, for that matter. Stick to soft solids and rope, and you’ll be just fine. In the end, the Knockout gives me hope for Kershaw. It’s like an up and coming contender, with loads of promise covering the few holes in its game. Like the Link and the Dividend, the Knockout represents a solid option among fans of American-made pocket knives.